But after watching the Indiana game, I've lost almost all confidence in Michigan's defense and Greg Robinson's ability to confuse a quarterback/offense. If Cousins is on his game, I think MSU walks away with the game. I think Cousins has a really good day in terms of completion percentage, but his YPA is low. Michigan gets at least one long touchdown in this game but I also expect Denard to throw at least one interception. As always, winning the turnover battle will be key if Michigan wants a shot at this game. The point is, all of the signs were there. Michigan's secondary was bound to cost them a game against a competent quarterback and passing attack. The linebackers have been suspect in the run game all year and MSU features three competent-to-good Big Ten backs. 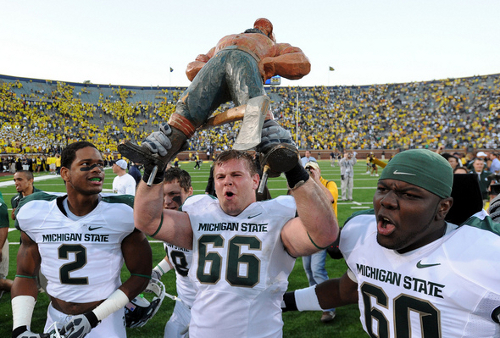 MSU features a defense with an All American linebacker able to at least partially slow Denard. And Denard was bound to fall back to earth against a good defense. The point is, all of the signs were there. We should've seen it coming. My brother and I were talking before the game and he said, "When you know a team as well as we do, it's difficult to pick against them." And in toss-ups like this one, it's true: I know what Michigan is capable of. I know that they have young talent that you'd think might overachieve once. You theoretically know how to shred MSU's defense. And so it's hard to pick against them. But we should've seen it coming. Despite the three interceptions, Denard had a fairly good day. He marched Michigan up and down the field and, were it not for two interceptions in the endzone, his stat line would look like this: 19-29, 235 yards (or thereabout), 3 TDs, 1 INT, 21 rushes, 86 yards, 1 TD. And everyone would be talking about how he's the Heisman front runner. He did look out of rhythm though. Part of that was due to poor protection from the offensive line; they looked bad in this game. Otherwise, Denard looked confused and lost on the field. He was double clutching on a lot of throws and just didn't look very confident. We'll chalk this up to growing pains and hope Saturday is better. Michigan can't tackle. Like, at all. The amount of missed tackles and yards after contact were an utter embarrassment. That the defensive personnel keep talking to the media saying, "We're tired of hearing we're bad," is comedy. These defensive players are bad at defense. One of the most suspect is Cam Gordon. I know he's supposed to be a "big hitter", but I'd rather he be a "big tackler". He was responsible for a lot of unnecessary MSU yardage. Greg Robinson played a noticeable amount of man coverage in this game. I'll have to rewatch the game to really see how it went. The only time it truly hurt Michigan was on the long touchdown pass on which Cullen Christian got beaten on a double move. But I was encouraged by the fact that Robinson realized his zones weren't working. Unfortunately, the poor linebacker play in man coverage also means that Michigan was susceptible to the long TD runs MSU produced. Speaking of the defense, the injury to James Rogers is probably a blessing in disguise (though I wish him well and hope there was no serious damage). Rogers' injury necessitated that Courtney Avery, Terrence Talbott, and Cullen Christian got meaningful playing time. One of them will be starting alongside JT Floyd against Iowa. Drops. The wide receivers looked bad. The whole offense was just out of sync. Iowa, a game that I thought Michigan would win from the beginning of the year, will beat Michigan on Saturday. The preview will be identical to the MSU game. The result will also be similar. I say this with the best of intentions since I think you actually are close to a great blog, but man you have to stop fellating yourself in every other post. They too often start the same: "Look at what I have knew and have always known and you, reader, didn't, so look at how awesome I am." You did it on a post a bit back where you bragged about being in a room with your friends and you were the only one who understood football. Then a few weeks back you only linked to your previous posts, cherry-picking the quotes where you were correct and trying to justify how awesome you are. And now it comes again today. Again, this probably sounds like a personal attack, but I mean no harm. I like your analysis and substance, but I can do without the over abundance of back-patting. Keep up the good stuff though, and Go Blue! Good point. This was more of a "this should've been obvious to all of us" post, but I can see why it would've come off otherwise. I'll keep an eye on this in the future. I find it very interesting that Gerg finally deployed more man to man defense and blitzed more, which is what you've been calling for, and the results were either similar or worse. You've been cricizing him for NOT doing this thing, and when he finally does it...the defense still gets torched. Um, maybe there was a reason why he wasn't doing it, and maybe you were wrong in the first place? Newsflash: Gerg knows his players better than you, and always will. When he decides to rush 3 and drop 8 in a zone, I'll trust him more than I'll ever trust you. I'll be rewatching the game to see whether or not Michigan really did get beaten much in man coverage. The one time that I really remember was mentioned above (the TD pass that Christian got beaten on). But I don't remember every play on which they ran it. Whether or not it was man coverage on the long runs is yet to be seen. I'll probably do another man vs. zone comparison this week as it was obvious that Robinson changed something up. To Anonymous, here is my breakdown of Michigan's man/zone defensive front against MSU.